This system generates an easy to read “At A Glance” Report for QEEG from BrainMaster MiniQ I/II as well as the Discovery. Both 12 and 19 channel maps are available providing information on magnitude, dominant frequency, asymmetry, coherence and phase. 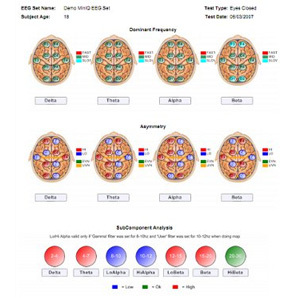 In addition, meters and dashboards suggest what areas of cognitive function as well as what emotional functions report also provides suggested peer review neurofeedback protocols and Z-Score Placements for Z-Score Training. The system is Internet Based and clients can log on at home and fill out cognitive emotional questionnaires that are correlated with EEG report. One year subscription includes no limits on maps or extra charges for updates and improvements that retroactively inform all previous maps. The database presently contains over 1000 subjects ages 6-90 and is growing daily.